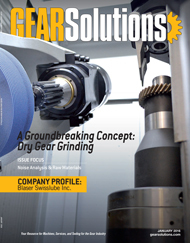 The development of a groundbreaking technology for a completely dry grinding process without the need for cutting oils and the release of a new dry-grinding machine has the potential to significantly transform the production of transmission gears. 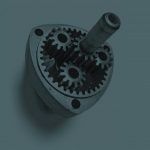 Despite the many high-speed, high-torque direct-drive technologies developed over the past years, the overall efficiency of gearboxes is still state-of-the-art. 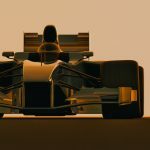 Specifically, automotive powertrains have evolved toward smaller engines with just three or four cylinders in combination with 7- to 10-speed transmissions. As a result, in the last couple years, the global total production of transmission gears has been growing at much higher rates than the production of cars. 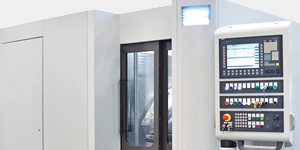 The manufacturing industry has been following this trend by introducing new machines with reduced non-productive times, and some of which even have dual work spindles to parallelize machining with loading/unloading of parts. 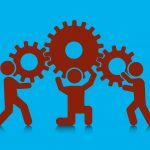 All of these activities are consequently driven by the objective of higher productivity. But for decades in the transmission industry, the process for producing gears, starting from raw material, has been these production steps: 1) soft-turning, 2) soft-hobbing the gear teeth, 3) deburring, 4) hardening, 5) hard-turning, and lastly, grinding the gear teeth. Of these process steps, the grinding of the gear teeth is the most sophisticated and most expensive. That’s why, until about 10 years ago, the majority of gears were not even ground after hardening. 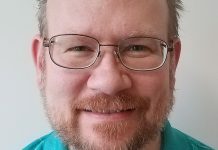 But today, the demands on efficiency and noise emission are higher — almost all newly introduced transmissions have precision demands — which makes the grinding inevitable. So, production must adjust and bear the cost. 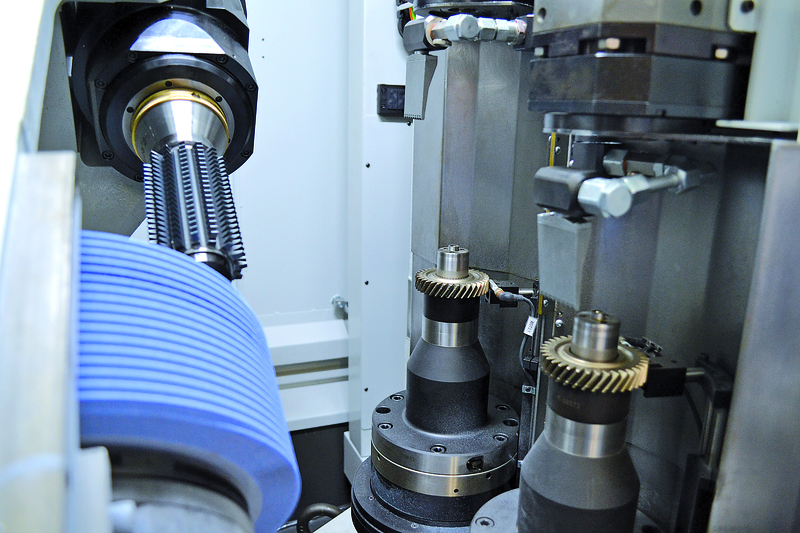 The reasons why gear grinding is expensive is not just because machinery is expensive and not just because of the high tool costs; a major contributor to the cost of gear grinding is the use of oil as a coolant in the process. It’s important to note that the aforementioned production steps can be performed “dry,” except the final grinding of the gear teeth, which needs an oil-based lubricant. And, it’s specifically the use of oil that is a cost driver to this process. And, all of these units consume valuable space. 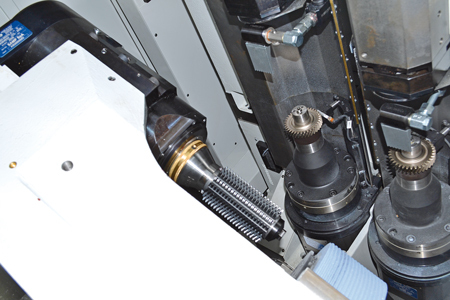 A typical installation for gear grinding only uses less than half of the space for the grinding machine; the larger space is used by all the supporting supplies. Besides, it is even more important to consider that the energy consumed for running these systems is around 75 percent of the total energy requested by the grinding process. Next is the oil itself. Per machine, between 2,000 to 4,000 liters of oil are needed as an initial fill, but depending on the application, 100 to 200 liters get lost every month. It’s getting lost to the washing machine, to the air, to the ground, and other locations. Grinding is different from dry cutting processes in that it does not create metal chips that can easily be recycled. It creates swarf — a mixture of metallic chips, abrasive particles, and, of course, oil. Therefore, it needs expensive special treatments to separate and dispose its contents. Finally, cutting oils imply hazards to our environment and our health. Taking these considerations, Samputensili is presenting a ground-breaking technology on its new, dedicated dry hard-gear finishing machine, the SG 160 Sky Grind. 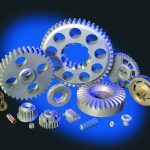 Why Is Oil Needed in Gear Grinding? 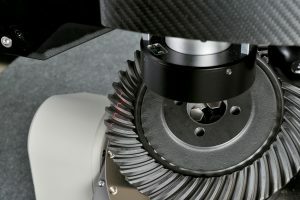 Only a part of the grinding technology is based on cutting chips. 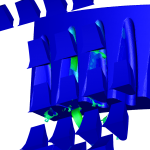 The lack of a defined cutting edge creates plastic deformation instead of material removal, and it creates friction and heat as a result (see Figure 1). Reducing this friction and discharging the heat are the two primary technological tasks for the oil. 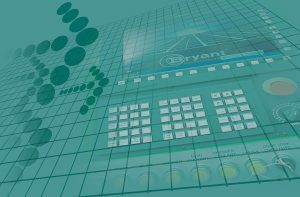 Secondary tasks serve chip transportation and thermal stabilization of the machine. 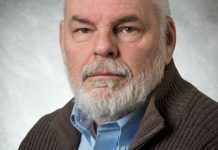 While chip transport and thermal stability may be addressed by the conceptual design of a machine, the technological need for oil due to friction and heat seems inescapable. But in studying the grinding basics, which were proven over 40 years ago (see Figure 2), we learn that: At the same removal rate (which compares to productivity), grinding with small infeed and high feed rate creates much less heat than grinding with high infeed and small feed rate. 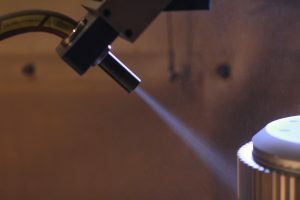 Beyond this, comparing the use of oil to dry grinding shows that the benefit of oil in regards to the surface temperature is almost vanishing at small infeed. And microscopic views show the ground surface getting scattered at high infeed without the use of oil, while it remains smooth if only the infeed is small. 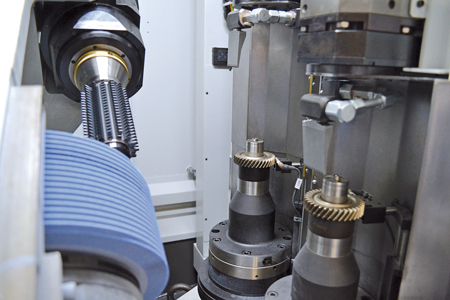 Today, grinding of automotive transmission gears is mostly done in two passes: a roughing and a finishing pass. During the roughing, around 80 percent of the total material is removed and the gear flanks are cleaned for the final finishing pass. The infeed for this finishing pass is already small, and it can be made even smaller to make dry grinding work as previously explained. 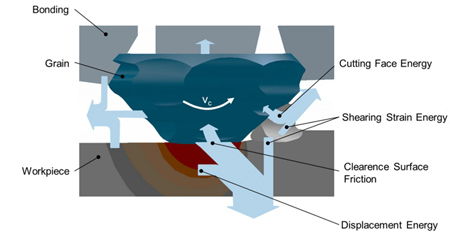 It is the roughing pass that is critical for dry grinding, because stock to be removed is too much to fit the described approach. On the other hand, technologies exist that can remove a high amount of hardened material without any oil and without introducing excessive heat into the workpiece surface. 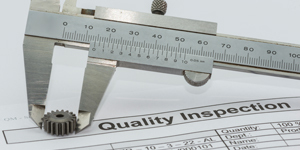 Hard turning is one example, and it has become state-of-the-art in the bearing industry. 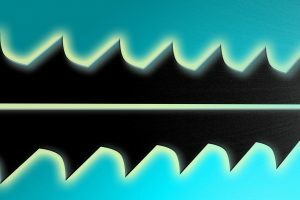 But even in gear production, hobbing of hardened gears with carbide tools (or skive-hobbing) is currently used without oil, even in mass production. 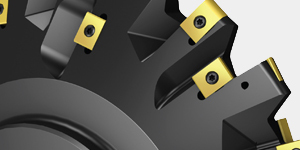 Steering pinions are typical applications. 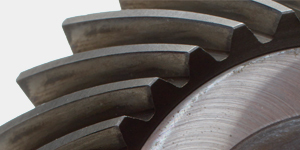 But skive-hobbing has not succeeded in producing transmission gears because the defined cutting edges of the hob create a regular pattern (feed and profile scallops) on the gear flank, which is unacceptable for durability and for noise (see Figure 3, left). This is one of the reasons why grinding has become almost mandatory as a finishing process. The smooth but irregular surface guaranties high load capability, high durability, and quiet running (see Figure 3, right). Thus, it’s logical to combine the removal rate of the dry skive-hobbing with the geometric accuracy and surface quality of the dry finish grinding process. 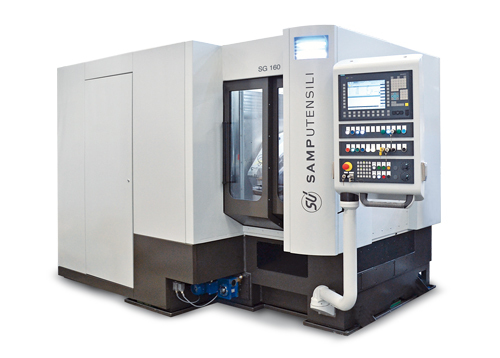 Samputensili has addressed this challenge by not only developing this dual technology but also by creating a new machine, the SG 160, to run this process for automotive mass production. 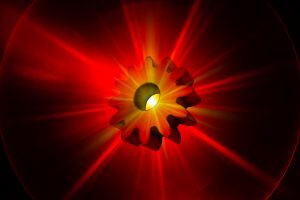 Hobbing, especially skive-hobbing of hardened gears with its continuous engaging and disengaging of cutting teeth at high frequency, is extremely dynamic and creates excessive passive forces. Tools of 50 to 100 mm in diameter run at 100 to 200 m/min cutting speed, resulting in just 300 to 1,200 rpm (see Figure 4, left). Grinding is much smoother but the gear generation cinematic is still more dynamic than any other grinding process. Tools are larger (about 200 to 300 mm) and run at 60 to 80 m/s with a resulting rpm of 4,000 to 7,000 (see Figure 4, right). 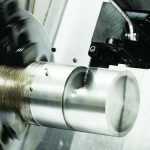 To avoid geometric constraints given by the different tool diameters and be able to perfectly control position and speed of the tools at their nominal speed, the SG 160 has dedicated tool spindles instead of having both tools on one: one spindle for the skive-hob and one spindle for the grinding worm. All current machines in the market stack four axes one on the other (X-Z-A-Y) before it comes to mounting the tool spindle. But each of these axes adds its own error to a total positioning error, and the overall stiffness decreases with each axis in the stack. The new SG 160 not only takes the X-axis out of this stack, but it also changes the order of the other axis to Y-Z-A by moving the main column in the Y-axis direction instead of the tool spindle support (see Figure 5). By doing so, the mass in motion (inertia) is significantly higher compared to any other gear grinding machine and therefore provides much higher dynamic stiffness. Another feature of current gear grinding machines are the two workpiece spindles for shortening the non-productive time when changing parts. While a gear is ground on one spindle, parts are changed on the other. Despite this, the non-productive time has never gone under five seconds because the spindles are located on a rotary table, which is hydraulically locked in position but is inaccurately floating while moving. The unlocking, the settling after moving, and the locking in the new position take more time than the motion itself and cannot be any faster by design. 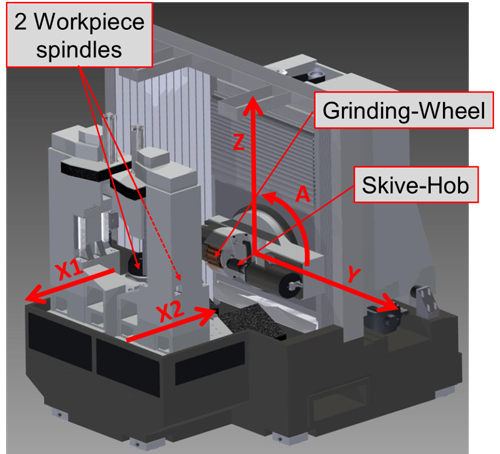 However, the SG 160 splits the X-axis of current machines into two linear slides (X1, X2), each of which carries one workpiece spindle (see Figure 5). So both work spindles are under full position control anytime. 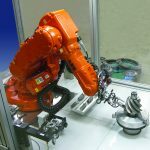 Driven by high dynamic 30 m/min linear motors, changing spindles can be done in record-breaking time — less than two seconds — including simultaneous repositioning of the tools with the Y, Z, A axes. The development of this new technology along with the SG 160 machine is a game-changer. The feedback is encouraging, and it confirms that this system will transform the production of transmission gears in the long run. 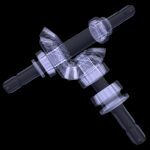 Dry hard finishing is eliminating the use of lubricating oil in gear production to not only cut costs but also to act as a milestone for a more sustainable production future. Compared to today’s wet grinding, total savings can be made on the investment, the consumables, the tools, and the energy, plus additional savings in less floor space and less cleaning. 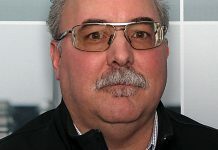 Next articleCompany Profile: CGI, Inc.
is the director of the Samputensili Machine Tool Division of SAMP S.p.A., and he is based is Italy. For more information, visit Samputensili’s North American partner, Star SU LLC at star-su.com. 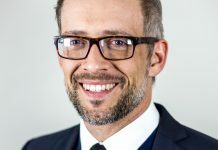 Company Profile: Blaser Swisslube Inc.